Today we were stuck inside due to a cold, but not bad enough off to not get crafty. My son and I made this special card for some one dear to us, and we hope that you'll make it for someone that you're thankful for. Nothing perfect about it, and I'm thankful for that! Scrap pieces of fabric, construction paper, and a little paint pulled our sentiments together perfectly. 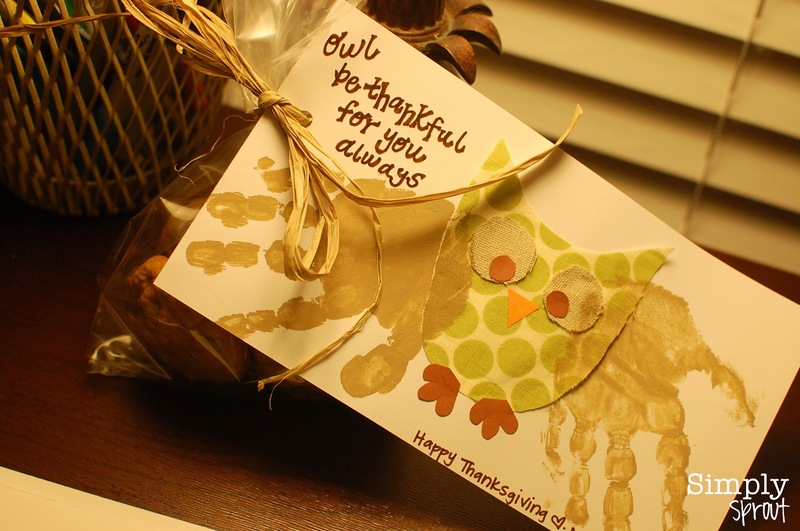 While the little one was snoozing off his symptoms I made some yummy cookies, Pumpkin Oatmeal Cookies with Dried Cranberries and Chocolate Chips, and tonight I tied them up in a bag to send with the sweet card. Teachers, volunteers, and loved ones will feel mighty special when a little hootie cutie like this comes flying their way!